Münster's Altstadt, or old town, has only a small number of hotels, mostly in the lower-priced categories. 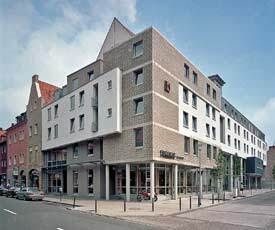 One centrally-located hotel that deserves attention is the StadtHotel Münster, which has a three-star superior rating and offers modern comforts in a location that's handy to sightseeing and shopping. Don't be put off by the hotel's boxy, angular façade: Inside, the Stadthotel is an attractive, comfortable hotel in a style that might best be described as "Teutonic modern." And while the hotel caters heavily to business travelers, it's popular with leisure guests--especially on weekends, when special packages are available. The Münster Stadthotel's 107 rooms come in three price ranges, with beds for one, two, or up to four guests. A restaurant and bar are on the premises, and there's even a chapel under the roof. Interesting side note: The Stadthotel Münster was founded by the local Catholic diocese and Kolping, an international charitable organization named after Adolph Kolping, a priest who organized housing and other services for young journeymen in the 1800s. (It was called the Kolping Tagungshotel until 2006). Today, the hotel--which was renovated and expanded in 2011--continues the tradition of offering free accommodation to the traveling journeymen called Wandergeselle when rooms are available. For more information, including rates, visit www.stadthotel-muenster.de.